Yet the area they chose for their town was already occupied by the people who had built such places as Kolomoki, Rock Eagle and Fort Mountain. These people had been in Georgia for hundreds and thousands of years thus this Muskogean invasion would be met, like all invasions, by fierce resistance from the local population. The Ocmulgee Mounds site was protected by two defensive ditches with log palisade walls. These moat/wall features protected three sides of the new Muskogean colony from attacks by their neighbors. The Ocmulgee River provided natural protection on the fourth side. (When another group of invaders showed up in Georgia many centuries later– the British– they also followed a similar pattern and located their colony of Frederica near a river and then surrounded the other three sides with a defensive ditch and palisade wall.) The moats also served as trash pits since large amounts of broken pottery and other artifacts were excavated from them. 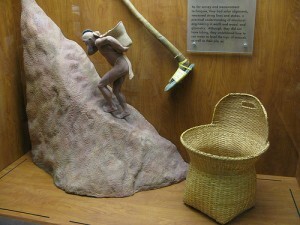 This museum display shows how the mounds were built with simple tools and hard labor. The building of the large temple mound required a herculean effort. Only simple stone and shell tools were used to dig the dirt and clay required for its construction. This dirt and clay were then loaded into baskets and carried on the backs of laborers to the construction site. Here it was dumped and amazingly a thousand years later archaeologists were able to make out individual basket loads in the mounds they excavated. The labor for this immense effort most likely came from enslaved local woodland Indians. This would not have endeared these newcomers to the local population especially when combined with the knowledge that the previous inhabitants of the site were all massacred save two people and a dog according to the migration legends. Thus the defensive ditches and palisade walls were likely built of necessity! 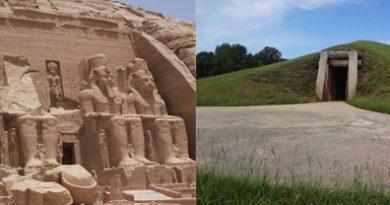 One characteristic of Mississippian culture is they built structures on top of their mounds which served as temples and also residences of an elite class of people. (Watch Animation) These people inherited their status as opposed to earning it. This fact undoubtedly caused much suspicion on the side of the indigenous Woodland people who were an egalitarian society where status was earned. 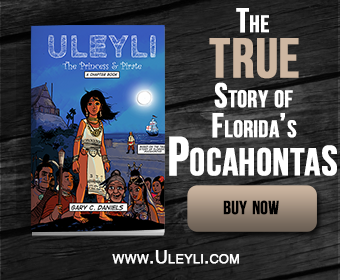 Even as late as the historic period when Spanish explorers came into contact with these societies there is evidence that this inherited status was looked upon with great disdain by many Native Americans in the region and was the source of many conflicts. This seems to be a very human and natural reaction to inherited power that cuts across all cultures thus it must be assumed that this animosity probably existed from the beginning of Mississippian influence and grew as their influence grew. The location of Ocmulgee Mounds was ideally situated to dominate local trade routes. It was located right on the boundary between two distinct geographical regions of Georgia: the coastal plain and the piedmont. The dividing line between these two geographical regions is called the Fall Line. 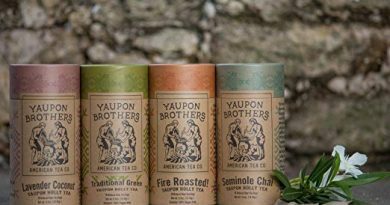 It is here where a drastic change in elevation takes place (as anyone who’s driven on I-75 through Macon can attest since it appears one is driving straight up– or down– hill, depending on the direction.) This also means there are natural shoals and falls in the Ocmulgee River at this point which force cargo-laden dugout canoes to shore. In fact the name Ocmulgee is actually a Hitchiti word that means “bubbling/boiling water” due to these rapids. 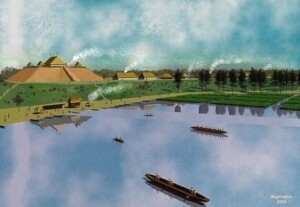 This computer reconstruction by architect & author Richard Thornton shows the wetland as a probable “port of entry” for the Ocmulgee Mounds site. 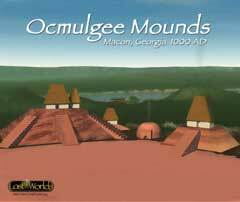 Thus Ocmulgee Mounds was perfectly located to be the middle men between the coastal and piedmont traders. 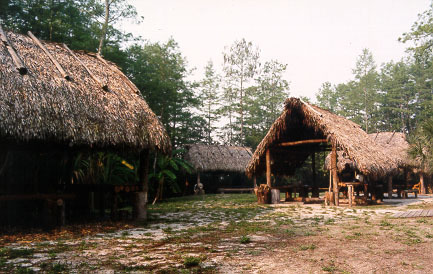 Smoked or dried seafood and alligator meat, alligator skins and teeth, seashells and seashell jewelry, sea salt, and other items would be traded inland by coastal peoples in exchange for items they lacked such as stone for tools and weapons, and vice versa. The wetland immediately below and to the east of the Great Temple Mound was likely a port where trade canoes docked to unload their wares. Interestingly, magnetometer scans have revealed that the Great Temple Mound had a spiraling staircase oriented towards this “port of entry.” This spiral staircase makes it unique among all Mississippian platform mounds discovered so far. 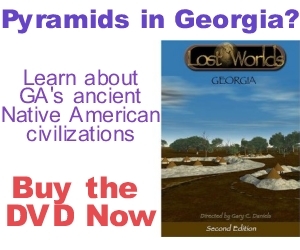 History shows that middle men and facilitators of such trading transactions usually create great wealth and power for themselves and so it was for the elite class who lived at Ocmulgee. It is likely as their power grew so did their greed as they demanded a larger and larger cut for themselves by manipulating exchange rates between trade goods. 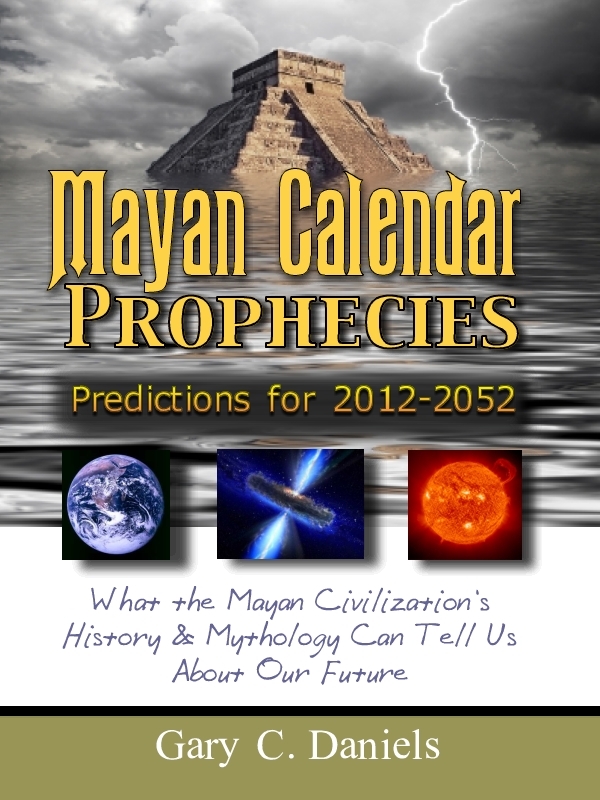 The weaker tribes would have had no choice but to abide by the exchange rates set by the powerful traders at Ocmulgee. As these rates became more and more unfair, the weaker tribes would have looked for ways to bypass these middle men. This would, of course, lead to conflict when discovered and the elites at Ocmulgee would naturally mete out harsh consequences for such activity. This, in turn, would lead to greater resentment by the weaker tribes until, over time, Ocmulgee found itself surrounded by angry tribes in every direction. 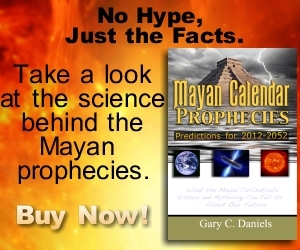 All that would be needed is a moment of weakness caused by some natural calamity such as a drought and Ocmulgee would find itself in a hazardous situation. Such seems to be the natural pattern of human interaction throughout the globe and across all time periods including today.Continues….